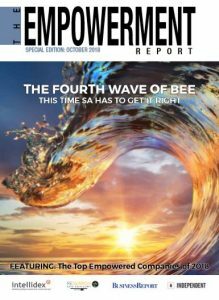 In 2013 Intellidex and Empowerdex launched a new definitive ranking of the empowerment status of South Africa’s listed companies. It set the bar for the rest of the economy by showcasing the companies that have gone furthest in transforming South Africa’s business environment. To be named the most empowered company in an industry and the country is a major accolade for the companies concerned. The research is conducted by Empowerdex and Intellidex produces the publication for our media partner, Business Report. We rank JSE-listed companies on their BEE scores overall, as well as in each industry and in each category of the BEE scorecard. This is accompanied by editorial analysis. Empowerment rating and research agency Empowerdex has been researching and ranking listed companies for over a decade. As black empowerment has become one of the major strategic challenges for South African companies, Empowerdex’s research has been decisive in measuring it. The research studies JSE-listed companies in each sector and determines which have done best overall on the various factors that are important in empowerment: from ownership to enterprise development. The research is interpreted by the team of analysts and financial journalists at Intellidex. If you need access to earlier Most Empowered Companies reports, contact Colin at canthony@intellidex.co.za.